For the past five years I have had a part time job working for a business that distributes a controlled substance in the state of Colorado. People seek out this business to procure pure products that have a multitude of perceived health benefits. The federal government allows the states to determine how this substance is regulated. While this substance is legal in some states, many fear that if this substance were universally legalized it could lead to the death of many citizens. The government can shut down any facility that distributes this product illegally. I work for a raw milk dairy. Raw milk is simply milk that has not been pasteurized or homogenized. Almost any carton of milk you pull off a grocery store refrigerator shelf will have undergone both of these processes. You can pasteurize any liquid to kill bacteria by heating it to a high temperature for a specific length of time. In the United States there are several types of pasteurization that make milk legal to sell. High Temperature/Short Time (HTST) pasteurization heats the milk to 161° F (71.1°C) for 15-20 seconds; Extended Shelf Life (ESL) pasteurization has a lower temperature than the HTST treatment, but includes a microbial filtration step; and Ultra High Temperature pasteurization, often known as “Ultra Pasteurized”, means the milk has been heated to 275°F (135°C) for at least one second. Homogenization is the process of micro-slicing fat particles so that the fat molecules in the milk stay in suspension. Milk is a mixture of solids (fats, proteins, and minerals) and liquids (mostly water). As happens with most oil and water solutions, the fats rise to the surface. Homogenization slices the fats finely so they no longer rise to the top of the liquid. 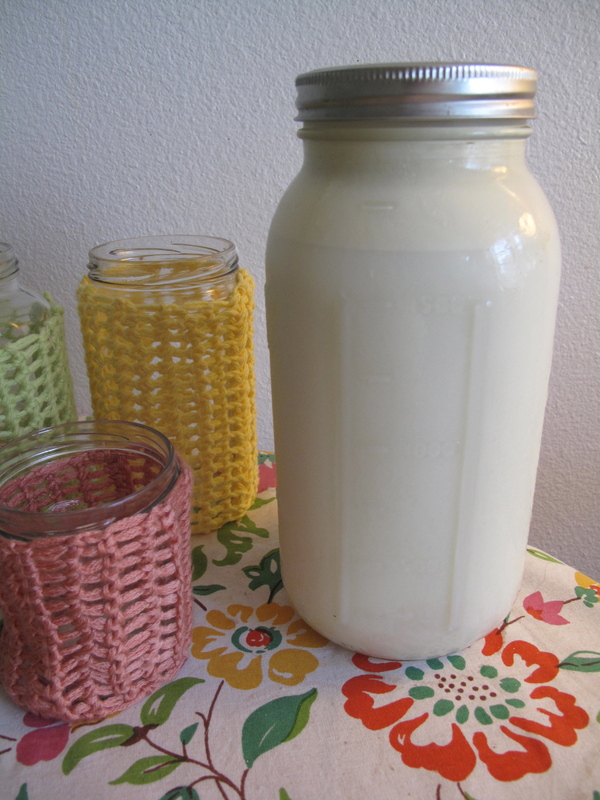 A jar of raw (unpasteurized unhomogenized) milk. The cream rises to the top. When I was hired to work at Windsor Dairy I knew what pasteurization and homogenization were, but I didn’t exactly know what raw milk was or why it was illegal. I fell into this job, almost by accident, when a farmer’s market on Sunday afternoon and was offered a job at Windsor Dairy. I had met Drs. Meg Cattell and Arden Nelson, the owners of Windsor Dairy when I worked part-time for Organic Valley Co-op as “event staff” giving out samples of cheese and milk at various festivals in northern Colorado. At that time Windsor Dairy were members of Organic Valley, a farmer owned co-op of 1600 farmers across the nation who sell their organic products under the same label. I was also graduate student in philosophy with a concentration on environmental and animal ethics and I enjoyed visiting with Meg and Arden when I had the opportunity. Meg hods an undergraduate degree in Anthropology, a Masters in Environmental Health and is a Doctor of Veterinary Medicine. Arden has a Ph.D. in Nutrition and is also a Doctor of Veterinary Medicine. Meg has traveled the world to study indigenous dairy products. She has lived in the Orkney Islands, Provence in France, and did research in India and Nepal on a Fulbright Scholarship. They are both recognized as top dairy veterinarians and have been invited to lecture internationally and are often called on as expert witnesses in legal cases. Any assumption that farmers were “simple folk” was banished from my mind after visiting with Meg and Arden and watching them talk to the public about dairy products and their dairy. At that time they had over 500 cows in their milking herd divided between two dairies with milking parlors and started the Rocky Mountain Pastures milk-label for Organic Valley. When I ran into them at that fateful farmers market they had recently downsized their operation and converted it to a raw milk grass-fed dairy and started making raw-milk cheeses. They had scaled back their dairy because they had lost their lease on a large track of pasture, which had been sold to a builder for a sub-division. 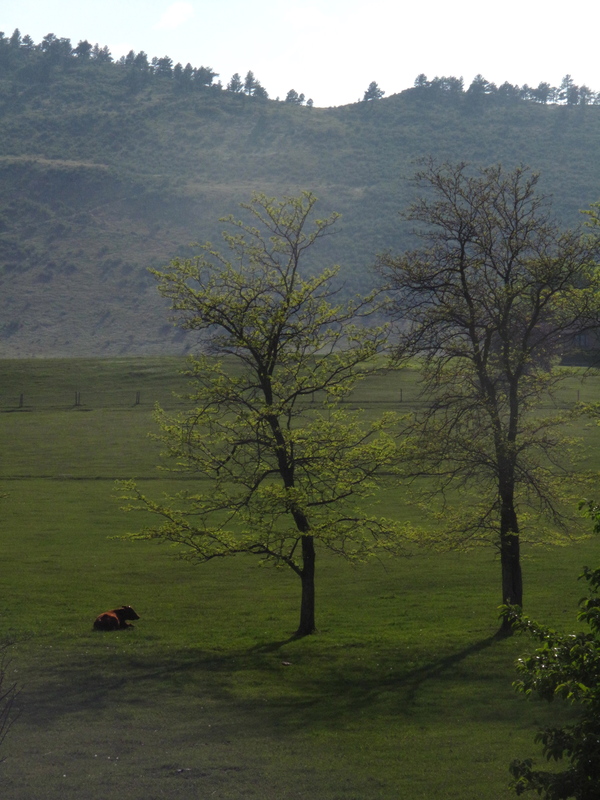 With less pasture at their disposal Meg and Arden decided that they did not want to run their sizable heard on minimal pasture and sold 500 of their cows to an organic dairy near Denver. As veterinarians Meg and Arden have studied the cow nutrition in great detail. They recognized that while grain-fed cattle produce a greater amount of milk than grass-fed cattle, grain-fed cattle suffer poor health. The fiber in grain makes cows flush more water into their udders, increasing the volume of milk they produce, but it causes their rumens to have a high acidity. A conventional Holstein dairy cow will average 15-18 gallons of milk per day (though 18-22 gallons per day has become accepted). There are 8.6 pounds of milk in a gallon. That is a minimum of 129 pounds of milk per day. Compare that to the 7 gallons of milk per day a cow on pasture getting some grain will produce or grass-fed dairy cow, which milks 3-4 gallons or less a day (around 25 pounds per day) and you can begin to see how unnatural it might be for a cow to produce more than 5 times the amount of milk than is normal for a cow to produce. Grain also makes a cow’s rumen unnaturally acidic and can cause ulcers in a cow’s digestive track. This is why the life span of a conventional dairy cow is 2-4 years and a grass-fed dairy cow is around 20. As they continued to research the best farming methods for cow health, the more they realized that if you provided cows with a lifestyle very close to that of wild cattle, the healthier their herd would be and they made the decision to operate as a 100% grass-fed dairy. Cows evolved to eat grass. Grain fed cattle often suffer from ulcers or bloat, two reasons they may require antibiotics to stay in production. Yet many people are prepared to pay three times more for what they consider to be “real food”. While pasteurization kills 99.999% of the viable organisms in milk, the process also destroys all the enzymes that aid in the digestion of lactose (the long sugar chain that many humans have an inability to digest) as well as any beneficial bacteria and all vitamins. Vitamins D and A are added back to milk to refortify it, but vitamins D, A, C, E, K, B1, B2, B6, B12, niacin, pantothenic acid, biotin, and folic acid are present in milk and destroyed during pasteurization. Homogenization makes the fats evenly dispersed through the milk and increased its shelf life, but breaking apart the fats denatures their molecular structure which our bodies know how to process. In its raw state milk contains several fatty-acids important for maintaining the integrity of cell walls, brain function, and the nervous system. Many people seek out raw milk for its perceived health benefits. A large number of people suffering from asthma and eczema have experienced relief from the symptoms of these diseases after consuming raw milk regularly. Also, many people that have lactose intolerance find that they can drink any amount of raw milk because the enzymes present in the raw milk enable their bodies to digest it without discomfort they experience with store bought dairy products. Other people subscribe to the advice of food guru Weston A. Price, now deceased. Weston Price was a dentist who studied medical anthropology and examined the dental records of several indigenous people, which he compared to the records of people in industrialized countries. He found that indigenous tribes did not experience the problems that many in the Westernized countries experienced with crooked and overcrowded teeth as well as other prevalent medical concerns. He blamed processed food, which lacked nutritional density, for the poor health many in the West suffered from and came up with a list of recommendations for eating whole and “live” foods, which include raw milk and naturally fermented foods. Meg and Arden were particularly concerned about the health benefits of their dairy products at this moment in time because they had just started a family. They both decided that organic, grass-fed raw dairy products were healthier for their family than processed grain-fed dairy products. Their business trademarks became, “Pour l’ amour de saches et des hommes” (For the love of cows and man) and “We made this food for our family and saved some for you.” The only problem Meg and Arden had with converting their dairy to a raw milk operation is the small fact that raw milk is illegal in the state of Colorado. Technically, it is illegal to sell raw milk in the state of Colorado, but it is legal to drink it from a cow you own. 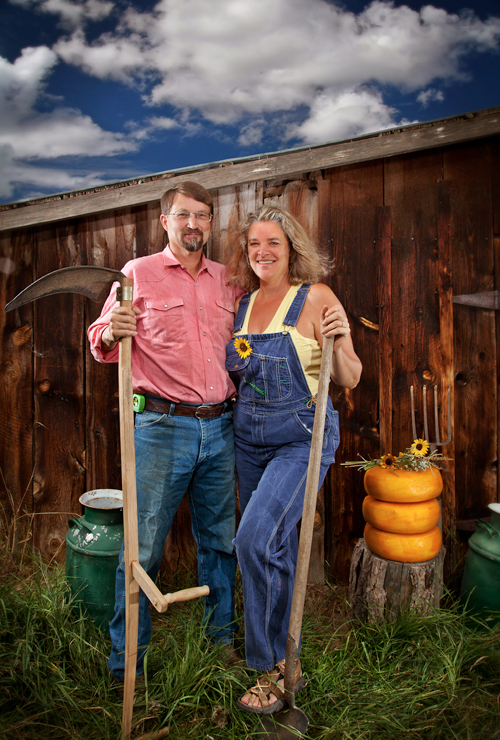 This means that every person who procures raw milk in Colorado owns a stake in a cow. Raw milk dairies share are member owned and members receive milk in exchange for the boarding fee they pay for their “cow.” The law states that people have to sign up for their share at the dairy. When you drink raw milk you are assuming the risk that you could contract a zoonotic disease (a disease that infects both humans and animals). The major milk-borne pathogens are tuberculosis, brucellosis, e. coli, salmonella and listeria (yes the same listeria that was harbored on melons this past summer). When you drink raw milk, you assume this risk, and in the eyes of Colorado Law, you should visit the facility you own a share in. These milk-borne diseases were the reason the United Federal Government banned the sales of raw milk, around the turn of the century, in the first place. The FDA and the USDA became institutions because food processors were either intentionally adulterating food or they were negligent in processing food and and selling dirty or adulterated food to the public. In Chicago, the same city Upton Sinclair wrote the The Jungle, massive dairies were built next to breweries so the cattle could feed on the breweries’ spent grains. This became a public health crisis when the dairies failed to maintain cattle clean enough to keep manure out of the milk and some dairies further betrayed the public trust by adding caustic substances to the milk to give it the appearance of fresh milk. These large city dairies created a public health crisis that was significant enough that the federal government decided the sale of milk need to be regulated. It then became illegal to sell raw milk, and to avert further pasteurization became standard. This does not mean that manure or puss does not end up in milk, it only means the pathogens present in milk are no longer viable. Today states are in charge of regulating the sale (or lack there of) of raw milk. It is illegal to sell raw milk in Colorado but legal to drink it from a cow you own. I personally support the Colorado law. If you drink raw milk, you should know where it comes from, the cleanliness of the dairy and what condition the cows are kept. In fact, I think everyone should know where their food comes from. The more I have learned about the industrial food system the less appealing buying anonymous food from the grocery store has become. Peanut butter, spinach, eggs, and melons have all been sources of food-borne illness in the past few years. Meg and Arden take care of their cattle above and beyond the standards called for in an organic certification. They also feel personally responsible for each and every one of their share members. This is why they devised a test for the four major milk borne pathogens that can be harbored in milk and have their milk tested every single week at a USDA facility. This is not cheap to do, but they feel raw-milk dairies should assume responsibility for their members. Once there is a demand for raw-milk distribution is one of the biggest challenges a dairy faces. Share members can pick up milk weekly at the dairy’s farm store in Windsor, open three days a week. Windsor Dairy also distributes raw milk to co-ops from Fort Collins to Parker and many towns along the way. The farthest drop-sight to the west is Evergreen, Colorado, a fair way up the mountains. I started working only the farmer’s markets for the dairy, but soon was asked to work at the dairy in the farm store. The first week I started working at the farm store my best friend was also hired to work for the dairy and we were both asked to deliver milk to the drop sights in Denver and then Evergreen. It was February and had recently snowed. We weren’t able to leave until the afternoon, meaning we were going to do most of our deliveries in the dark. We both have a healthy sense of adventure, but after several hours driving an aged refrigerated truck through semi-icy, foggy roads, our spirits had grown weary. At one point I exclaimed, “There is no way this can possibly be worth it!” recognizing how much it cost the dairy for the man-hours and gas to make the deliveries. We finally reached the last house, just as the fog settled uniformly through the forest. It felt like we were literally in the middle of no-where and even though it was already 9 p.m. on a Sunday night the family accepting the milk invited us in and gave us tea. We talked for over a half-hour and the family and their neighbor told us how grateful they were for the milk. The owner of the house told us that her son had such severe asthma they ended up at the hospital twice a year until he started drinking raw milk. After that the emergency visits to the hospital stopped completely. The neighbor’s child suffered from eczema and she attributed the milk for alleviating the painful rashes. Understanding the relief the mothers experienced from having ready access to a food that used to be freely available was moving and something I never will forget. There is a lot of controversy surrounding raw milk and if you watch food documentaries, like Farmageddon, you may realize how many obstacles a raw milk dairy has to overcome in order to provide people with unprocessed milk. Ever since I sat in that kitchen and listened to those mothers’ stories and the relief they felt when a simple glass of milk ended so much suffering for their children, I came to the conclusion that despite the hassle raw milk is definitely worth it. It isn’t 100% safe, but it is statistically safer than eating peanut butter and if it means I am supporting an industry that provides exceptional welfare for cattle and provides people nutritious and delicious food, I will happily forgo eating out a couple times a month and pay three times more for exceptional milk. This entry was posted in United States and tagged dairy, grass-fed, Raw milk, Weston A. Price, Windsor Dairy. Bookmark the permalink. Hi Susan. Good to hear from you. Thanks for your kind words. Looking forward to seeing you in December! I am associated with Dr.YVK and Kamadhuga movement. Will be in California after Feb 2012 – and hope to be in touch! Meanwhile, all the best to you all, the producers and deliverers of the Nectar to the needy kids/people in the drop-off range! Thank you for all your kind words and for sharing your experience. Please stay in touch. Epic! I’ve been drinking raw milk for a little bit now, but I was not aware of some of these facts thanks.